This post was written by two Calvin College students, who spent two weeks in La Unión as part of an internship with their semester in Honduras program. Our names are Eric and Isaac and we’ve been studying in Honduras for about three and half months through our school, Calvin College. We study international development, and as part of our class, we have a two week internship at an organization of our choice. We visited Unión MicroFinanza earlier this semester with our class, and we were very interested in how it is run and how it has found a home here in La Unión. 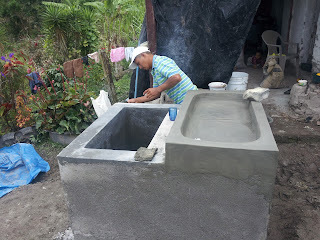 Noe Amaya works on a pila in Nueva Paz. I stayed in Nueva Paz for two nights and three days with Noe Amaya and his family. Noe is one of the construction leaders for a Community Partnership pila project (pilas are concrete basins used for storing water and for washing). The first day, I got to help work on the pilas with him, and I asked him questions about the partnership groups that came to Honduras. We had some great conversations and I was quite impressed with my Spanish! Staying with his family was awesome and it practically moves me to tears how loving the family was toward me. And he has three sons! As a guy that has grown up with two sisters, I was pumped. I got really close to all of them: their ages were three, twelve, and thirteen. Even as I was there hanging out with them, they kept telling me I had to come back and see them again. The second and third days I worked with the two older boys in the coffee fields. The field was about a 30-minute hike away, and it was tough. It hurt my pride a little because I was walking the trail slowly and cautiously while they were running and jumping through it. The field was in the middle of the mountains and the view was gorgeous. For two days I cleaned the coffee fields, which is a fancy way of saying hacking away at long grass surrounding the coffee plants with a machete. These two kids work in the fields every day. If they’re in school, they go to the coffee fields after classes, and if they don’t have school then they work most of the day. The fact that coffee is so big in the area reflects UMF’s development method once again – by seeing what the people are doing and how they’re living. UMF’s microloan and education program, market access, and emphasis on quality reflect a perfect fit for the communities when it comes to development. Through our discussions with UMF staff, we learned how the Community Partnership Program is different than other short-term programs. UMF, the partner organization, and the community work together to build relationships that help foster greater understanding of the needs and resources of the community. And the community is involved at every step through a community board of directors who help make decisions. Isaac DeGraaf and Eric Hollis in La Unión. The aldea I went to is called El Águila. It is one of the smaller aldeas around La Unión and it consists of about 15 houses and 90 people. Like most of the area around La Unión, it is surrounded by fields of coffee. I stayed with Francis Castillo and his family, and they own a coffee field about a 20-minute walk from their house. They are currently in the process of picking coffee, and I was eager to get my hands dirty and involved in the process. So, 10 minutes after getting dropped off, I was picking coffee. Picking coffee isn’t a particularly hard task and almost anyone could do it. I was surprised to see not only Francis picking coffee, but also his wife, sister, nephew, and father. It was truly a family effort, and as they picked they chatted to pass the time. At about noon on my first day, the rain started and we called it quits in the field. I then experienced the life of a rural Honduran by trying to pass the time with not too much to do. I practiced English with Francis, who is currently taking lessons, I played countless games of bingo with Francis’s niece and nephew, and I sat on the bench outside their home watching the clouds come and go. Time seemed to go so slow, but before I knew it, dinner was ready and shortly after, bedtime. The next morning we were up at 6:30 to head to the field. We ate breakfast in the field before we started picking, and then the day repeated itself much like the first day. We finished picking at around noon and spent the rest of the day just trying to pass the time. I was so glad I was given the opportunity to live in El Águila and experience life in rural Honduras. During this development semester we have taken in Honduras, we’ve had the great privilege to be able to travel all over the country and experience the culture of Honduras. But one thing we hadn’t done was stay with a family in a rural town. We’ve seen a lot of the city life, which makes up about half of Honduras’s population, but we’d never really stayed in the rural areas of Honduras. These two weeks in La Unión were the perfect opportunity to learn about life in the aldeas with Unión MicroFinanza. An auto title moneylender won't waste your time; the length of you get all the ability information, once your auto is reviewed, you will know promptly whether your application has been embraced.